Have you ever wondered why some colours make your skin shine, your eyes pop and your wrinkles disappear whilst others make you look like you should be in bed recovering from the flu!! Well the reason for this is that most of us look better in one group of colours, they are often referred to as warm colours or cool colours. The warm colours of the colour spectrum are red, orange and yellow and the cool colours are green, blue and violet. If we have overall warm tones to hair, eyes and skin then we are considered warm and if we are the opposite then we are considered cool. You can tell whether you look better in warm or cool colours by doing this simple test. Do you look better in silver or gold, black or brown, pink or orange? If you chose silver, black and pink then you probably look better in cool colours and if you chose gold, brown and orange you are probably better in warm colours. Now before you go throwing out all your blue and green or orange and red clothing we need to understand that all colours can be cool or warm, it just depends on what shade or hue you look for. There are warm and cool shades of every colour it depends on where the colour sits on the colour wheel. 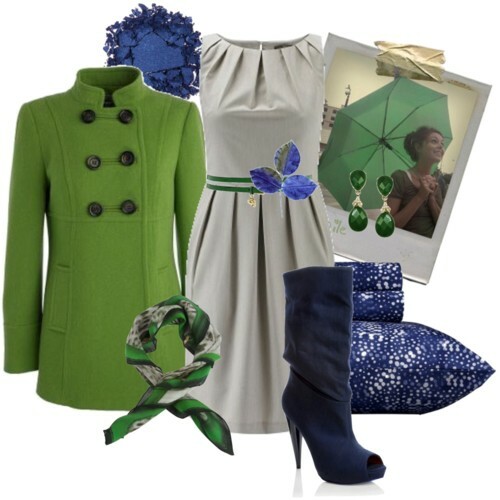 A blue that sits closer to green on the colour wheel will be a warm blue (for example, torquoise) and one that sits closer to purple (for example, dark navy) will be cool. This dress is a warmer blue because it is closer to green (check out the colour wheel above) and it is a good colour for someone who looks better in warmer tones but likes to wear blue. This Jacket is a very warm green because it has so much yellow in it, it therefore sits closer to yellow than blue on the colour wheel. The umbrella has loads more blue in it, therefore it sits closer to blue on the colour wheel and is a cooler green. What does all this mean to you!! 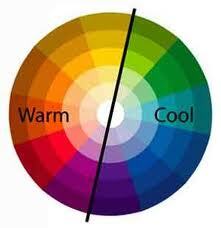 You can apply this theory to any colour and see what you come up with -Do you look better in cool or warm colours?? Go through your wardrobe, are there things in there that you've never worn before? maybe the colour just isn't right?